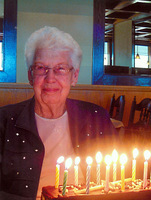 Provide comfort for the family of Ruth Widdows with a meaningful gesture of sympathy. Passed away at the Wedgewood Retirement Residence on March 30, 2019. Helen Ruth (Smith) Widdows, at the age of 98 years after a valiant effort of great strength and dignity. Beloved wife of the late Bert Bramley and the late John Widdows. Cherished aunt of the Smith, Carlyle and Acton families that spanned 3 generations. She was predeceased by her sister Amorette and by her brothers Graham (Gladys) Smith and Douglas (Rita) Smith. Family and friends are invited to a service in honour and celebration of Ruth's life at the Irvine Funeral Home and Chapel, 4 James Street East, Brockville on Saturday, April 13th at 1 p.m. followed by gathering in the reception centre from 2 - 4 p.m. Private interment will take place at Oakland Cemetery. As expressions of sympathy and in lieu of flowers, donations to the Brockville Public Library, TV Ontario or Tim Horton Children's Foundation, will be gratefully acknowledged. Send condolences or make a donation online at www.irvinememorial.com. A private interment will take place. Following Ruth's service, there will be a gathering of family and friends from 2 - 4 p.m.
BROCKVILLE PUBLIC LIBRARY TIM HORTON CHILDRENS FOUNDATION, INC.
Ruth was a wonderful teacher and friend! Enjoyed going to Retired Women Teachers lunches with her ! She will be missed !